It's been several weeks since I have posted my gratitude list. Oh no, it's not that I do not have anything to be grateful for! There's just always something ... anything ... even something you'd think is insignificant. However having an appreciative attitude in life, we learned that what we may take for granted someone else may be praying hard to have. So folks, my blog friends ... let's not take things for granted anymore. Awake each morning to a brand new day with gratefulness and give thanks even if it is just putting both our feet on the floor first in the morning. I try every day to make this practice ... "Thank you Lord for this brand new day where I will continue to enjoy your blessings and make amends for the mistakes of yesterday." 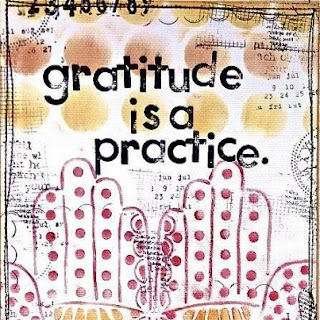 Practise gratitude because it makes us happy. The more we practise it, the more the effect gets to us. Yes this is true! People who approach life with a sense of gratitude are constantly aware of all that is wonderful in their life. Because they enjoy the fruits of their successes, they seek out more success. And when things don't go as planned, people who are grateful can put failure into perspective. So are you grateful for today?